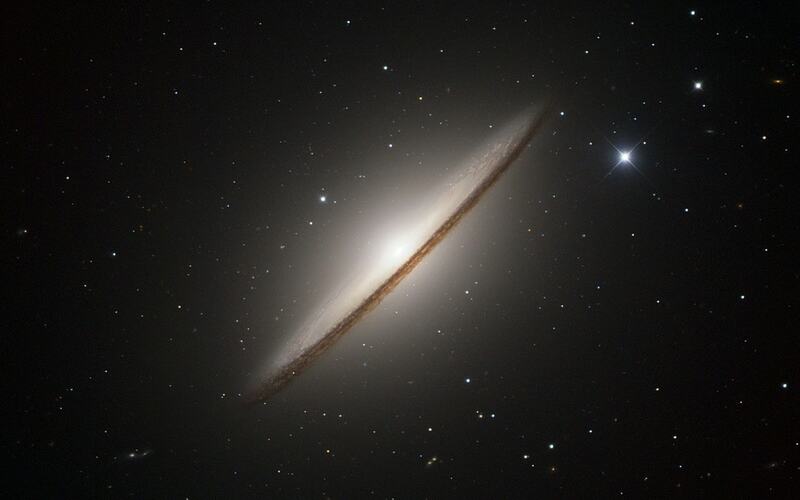 The Sombrero Galaxy has an apparent magnitude of 8.98 and lies at a distance of 29.3 million light years from Earth. It has the designation NGC 4594 in the New General Catalogue. M104 occupies an area 8.7 by 3.5 arc minutes in apparent size, corresponding to a linear diameter of about 50,000 light years. The galaxy is inclined at an angle of only 7 degrees to our line of sight and appears edge-on. It is visible in binoculars and small telescopes, but only appears as a small patch of light. 4-inch telescopes may hint at the galaxy’s dark dust lane under exceptionally good conditions, but the dust lane usually requires a 10-inch or 12-inch telescope. The galaxy’s bulge and disk are visible in 8-inch and larger telescopes. 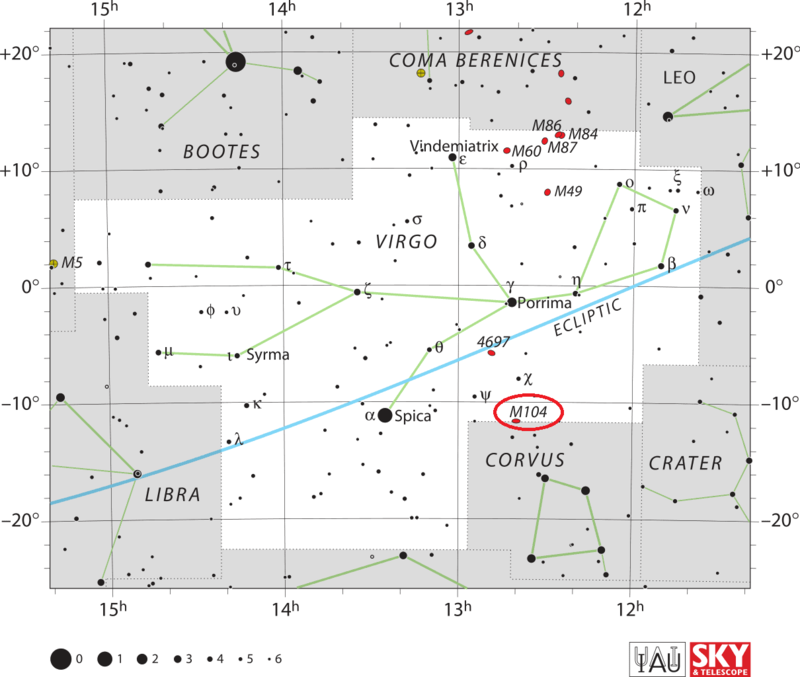 Messier 104 is located 11.5 degrees west of Spica, the brightest star in Virgo, and 5.5 degrees east of magnitude 4.31 star Eta Corvi in Corvus constellation. 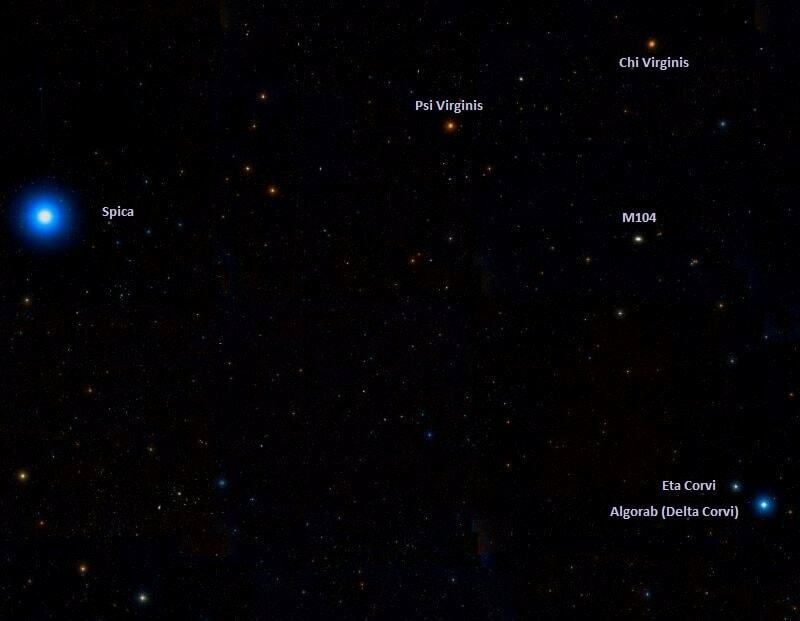 Spica is easy to locate using the stars of the Big Dipper. The line formed by the three stars of the Dipper’s handle extended outward first leads to the bright Arcturus in the constellation Boötes and then to Spica. The Sombrero Galaxy lies just next to the border with Corvus. The best time of year to observe the galaxy is during the spring. Messier 104 has an incredibly bright nucleus, an unusually large central bulge, and a conspicuous dark dust lane in its disk. 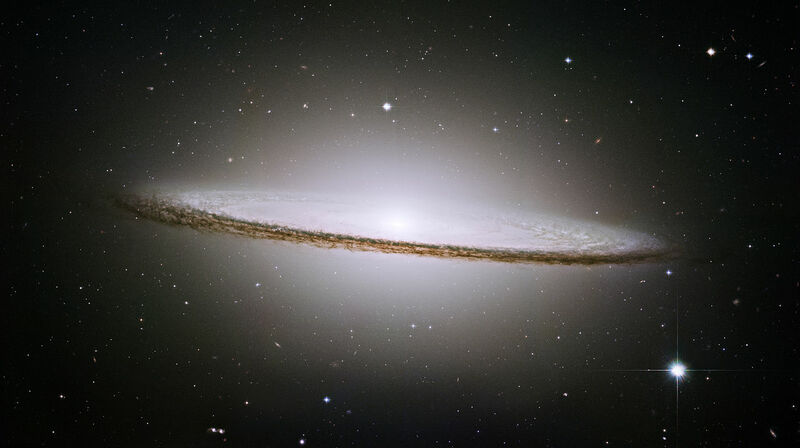 The appearance of the galactic bulge and the dust lane that crosses in front of it have earned M104 the name Sombrero. The dust lane has the shape of a symmetrical ring around the bulge. The ring contains most of M104’s cold hydrogen gas and dust and is the primary site of starburst activity within M104. 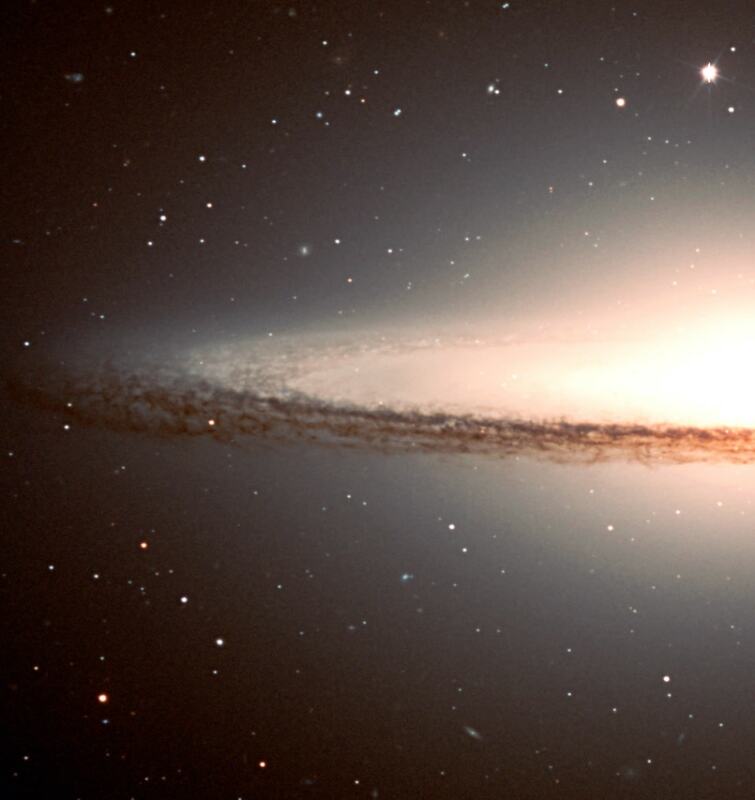 The Sombrero Galaxy’s large bulge and supermassive black hole at its core make the galaxy a popular target for study. The galaxy was previously believed to have a small, light halo, typical for a spiral, but observations with the Spitzer Space Telescope have revealed a considerably larger and more massive halo, commonly seen in giant elliptical galaxies. 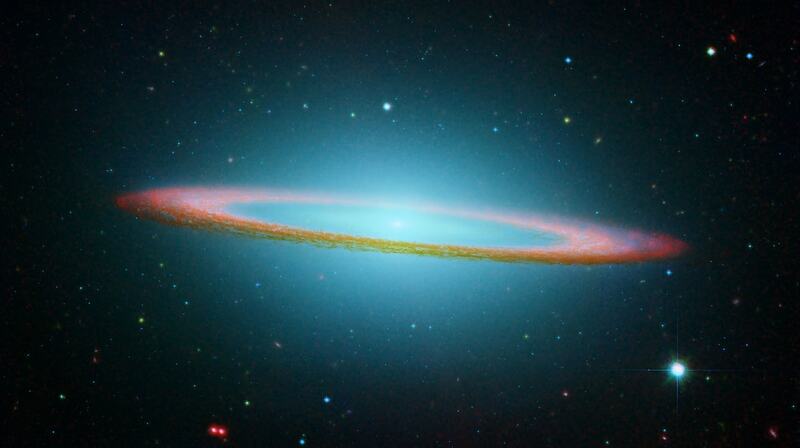 The Sombrero Galaxy’s vast halo may extend for 10,000 light years beyond the spiral structure. Messier 104 is part of a complex cloud of galaxies located to the south of the Virgo Cluster, but it is unclear whether it belongs to a formal group of galaxies. It may be part of a group that also includes the galaxies NGC 4487, NGC 4504, NGC 4802, UGCA 289, and a few others. An ultracompact dwarf galaxy (UCD), a very compact galaxy with a high stellar population, was discovered in the vicinity of M104 in 2009. The companion galaxy has a half-light radius of only 47.9 light years and an absolute magnitude of -12.3. Ultracompact dwarfs are suspected to be cores of dwarf elliptical galaxies that have lost their outlying stars and gas as a result of tidal interactions. Messier 104 has an absolute magnitude of -21.8, which makes it the brightest galaxy within 32.6 million light years of the Milky Way. Messier 104 has a large population of globular clusters. Observations have yielded estimates in the range from 1,200 to 2,000 globulars. The galaxy is receding from us at 1,024 km/s. M104’s enormous recession velocity was first measured by the American astronomer Vesto Slipher at the Lowell Observatory in 1912 and, at the time, it was the largest redshift ever measured in a galaxy. 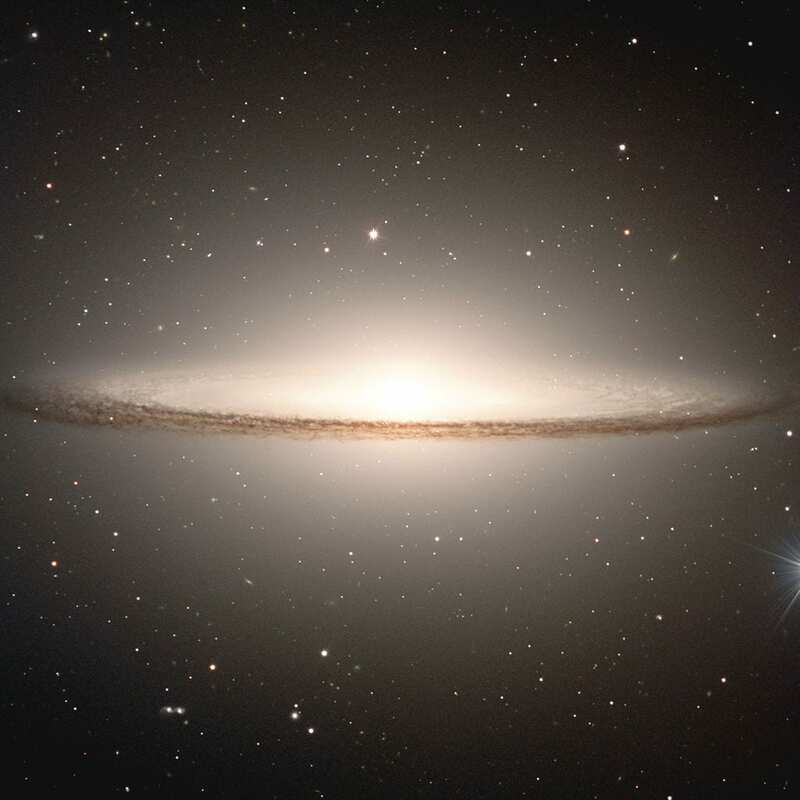 Slipher’s redshift calculation of the Sombrero Galaxy and similar observations from other galaxies provided a key piece of evidence for an expanding universe and the Big Bang theory. The nucleus of the Sombrero Galaxy contains ionized gas, but the gas is only weakly ionized, and the nucleus is classified as a low ionization nuclear emission region (LINER). Based on infrared observations, the nucleus of M104 is believed to be devoid of any significant star forming activity. The Sombrero Galaxy has a supermassive black hole at its centre. Studies using data from the Hubble Space Telescope and the Canada-France-Hawaii Telescope (CFHT) in the 1990s revealed that the speed of revolution of the stars near the galaxy’s core would not be possible unless there was an object with a mass of 1 billion solar masses at the centre. The central black hole in M104 is one of the most massive black holes detected in any nearby galaxies. Messier 104 was discovered by Charles Messier’s friend and colleague Pierre Méchain on May 11, 1781. Méchain described the discovery in a letter to Johann Bernoulli on May 6, 1783. On May 11, 1781, I discovered a nebula above the Raven [Corvus] which did not appear to me to contain any single star. It is of a faint light and difficult to find if the micrometer wires are illuminated. I have compared it [its position] on this day and the following with Spica in the Virgin and from this derived its right ascension 187d 9′ 42″ and its southern declination 10d 24′ 49″. It does not appear in the Connoissance des Temps. Charles Messier made a handwritten note about M104 and several other objects (M105, M106, M107, M108 and M109) and added them to his personal list. However, M104 was not officially included in the Messier Catalogue until 1921, when the French astronomer and author Camille Flammarion found Messier’s personal list, identified the object as NGC 4594 or Herschel’s H I.43, and declared that it should be added to the catalogue. Very bright; very much elongated, in position angle 2deg north preceding [NW] to south following [SE]; very suddenly much brighter toward the middle to a nucleus; 5′ long, 30″ broad, a bright star south preceding. There is a faint diffused oval light all about it, and I am almost positive that there is a dark interval or stratum separating the nucleus and general mass of the nebula from the light above (south of) it. Surely no illusion. 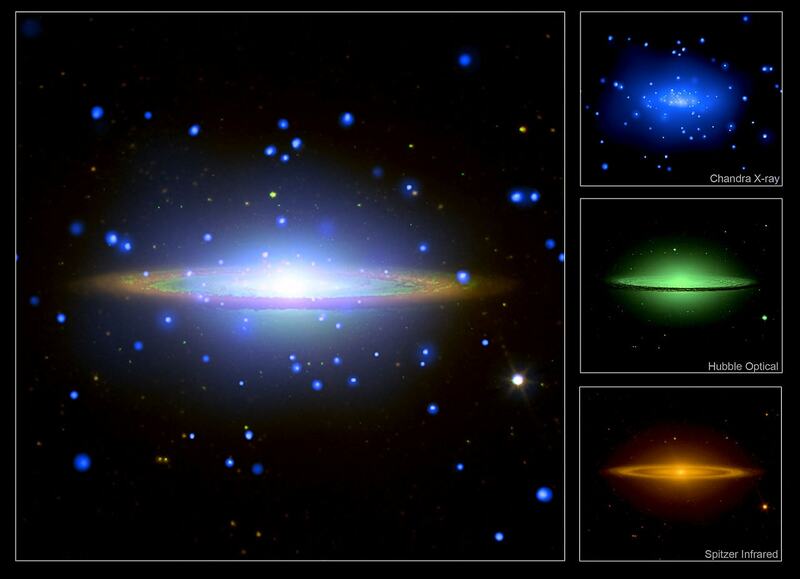 “The general form of elongated nebulae is elliptic,” says WH, “and their condensation toward the centre is almost invariably such as would arise from the superposition of luminous elliptic strata, increasing in density toward the centre.” This must be another of those vast flat rings seen very obliquely, already spoken of, and is an elegant example of that celestial perspective; it bears due west from Spica, and is 11d distant from that star, forming nearly a right angle with Beta Hydrae, which lies 12d to the southward. A remarkable, slightly curved, clear-cut dark lane runs along the entire length to the south of the nucleus; probably the finest known example of this phenomenon. There are very slight traces of spiral whorls.